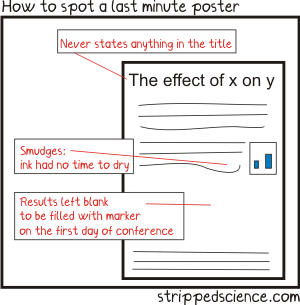 Are you tired of your supervisor telling you to redo your poster? Want to avoid text overload but don’t know where to start? Are you caught in the color conundrum? Larisa Blyudaya, award winning graphic designer with Communications, Education and Public Affairs and Tina Henne, Postdoctoral Program Lead will present on Communicating Science through Poster Presentations. The pair will share tips on distilling content, designing an eye-catching layout, use of color and resources to help make your posters shine. Real posters designed for a variety of audiences and award winning posters from last year’s Postdoctoral Research and Career Symposium will be used to illustrate concepts. We will also share tips from notable “poster gurus”. NOTE–this seminar is ideal for postdocs presenting at the 2015 Postdoctoral Research and Career Symposium. Awards will be presented to the top 3 poster presentations. Lunch will be served at 11:45. Program will begin at Noon. Please RSVP through this link by Friday, August 14th so we have an accurate count for food. This entry was posted in Announcements, Career Corner, Communicating Science, Events. Bookmark the permalink.